Best UK Cask Beer - Great Heck's Dark Force Treason Stout, I found this at the Egham beer festival back in October, and its complex blend of treacley, fruity and citrus flavours blew me away. Best UK Keg Beer - Given the unjustifiable price premium charged in the UK for keg over cask, I rarely drink UK keg. An exception was during some recent brewery visits where it was keg or bottle, and when I was rather impressed by Brew By Numbers' Saisons. Best UK Bottled or Canned Beer - Siren Broken Dream. Having encountered Ryan's Danish beers, I was intrigued to see what he'd come up with after he moved to the UK, and those I tried at Copenhagen Beer Celebration this year did not disappoint. Nor did his Broken Dream stout. Best Overseas Draught Beer - Klindworths Sauensieker Imperial Stout, amazing stuff, like a cross between an aged stout and a barley wine. Best Overseas Bottled or Canned Beer - Lervig Brewers Reserve Konrads Stout, wonderful stuff, and a reminder that good as Nøgne Ø is, it's not the only fine brewery in Norway. Best collaboration brew - Adnams / Pretty Things Jack D’Or. A version of a US beer, brewed in the UK as a special for Wetherspoons. Best Overall Beer - Hmm, tough one. It's not a new beer to me, but right now it's the Acorn Gorlovka Imperial Stout that I was drinking last night! Best Branding, Pumpclip or Label - I still love Magic Rock's artwork, but this year it's been just a tiny bit outshone by Siren. 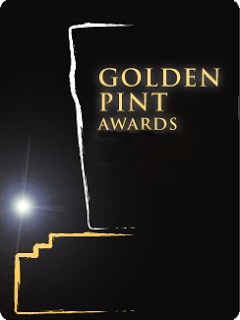 Best UK Brewery - There's so many new names and smaller breweries I could choose - eg. Siren, Gloucester, Kernel - but I'm going to choose one that this year did it all. It produced great beers for the mass market and at the same time showed it can innovate as well as any of the smaller boys, and that brewery is Adnams. Best Overseas Brewery - Klindworths, how this brewpub in a small North German village manages to produce - and sell! - such a huge range of exceptional beers still boggles my mind. Best New Brewery Opening 2013 - Brew By Numbers. Best beer and food pairing - stout and ice cream! UK Beer Festival of the Year - I missed GBBF and several others, but somehow I don't think I'd have enjoyed them as much as I did an afternoon at the Egham Beer Festival. A stack of new and interesting cask ales, almost all in perfect nick, and in friendly surroundings. Perfect! Overseas Beer Festival of the Year - this is a tough one! Hamburg's Craft Beer Days expanded to Berlin this summer, although sadly I couldn't be there then, and continues to be a fine showcase for characterful, non-industrial German beer. And then there's the loveliness of drinking Franconian festbier in the greenwoods at Annafest. For me though it was Copenhagen Beer Celebration, a festival of total beer geekery, loaded with rare and one-off beers from around the world. Independent Retailer of the Year - It's a little pricey by local standards, but Hamburg's Craft Beer Store has a great local and international selection plus helpful staff, and even beer on tap. Online Retailer of the Year - I didn't use any. Best Beer Book or Magazine - I wish I had time to read more! Best Beer Blog or Website - For the off-beat writing, it's Called To The Bar. Best Brewery Website/Social media - Oh go on then, it's Sambrooks for its extensive Twitter, Facebook and the wibbly-wobbly web. *This is a set of beery awards instituted by bloggers Andy Mogg and Mark Dredge; the idea is that anyone who wants to do so can offer their list, Andy and Mark then compile “best of” listings. Happy New Year everyone, and may next year bring us all even more wondrous delights to drink! Keg or cask for stronger beers?